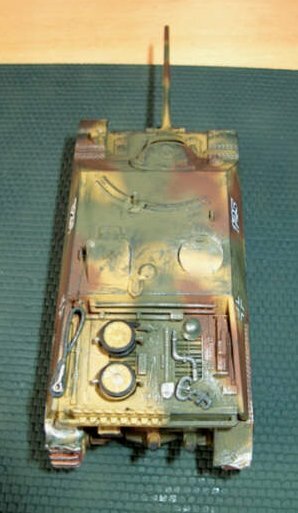 After picking up newest rumours on the Missing-Lynx forum, I was forced to hurry bringing out my construction review of ESCI's Jagdpanzer IV. I learned that Hasegawa is going to release a new JgdPz IV L/48 (short barrelled) and L/70 (long barrel) thanks to Nakagama Kenji. I don't want to speculate too much but I'm pretty sure that if these kits really appear, they will be new molds with Hasegawa's well known vinyl-tracks. After analyzing Doug's great Jgpz IV correction article, I felt very much inspired to build a Jgdpz IV myself because there were no correct injection molded kits on the market, plus the ESCI kit is very hard to come by. With great disappointment, I realise that my kit won't be that special at all if Hasegawa is going to release its new Jgdpz IV kit. First of all, I took most of the "equipment" from a cannibalized Revell Panzer IV J. I know that folks in some other areas in this world would slap me for doing so, but as I'm sitting near to the source it didn't bother me. The first step I did was to replace the awful wheels. The bogie wheels are okay, but they are missing out on the fact that the bogie wheels on the first two stations were often replaced by rollers that had less rubber and looked quite different. This measure was often referred as "laufruhiger Block" in late Pz IV J style Jagdpanzers to compensate for the overhang of the large Panthergun. The ESCI bogie wheels were replaced with Panzer IV J wheels, excluding the first two stations on each side. I often heard that Revell's Stug IV bogie wheels would look like these special ones, and I had one lying around so I gave it a try. The hardest thing was to cut them into two but it finally worked. I used superglue to fix the sprocket wheel, idler and return rollers as well. The return rollers on the original kit looked really poor, sometimes I was really surprised how a company can produce kits of such various quality within the kit line. 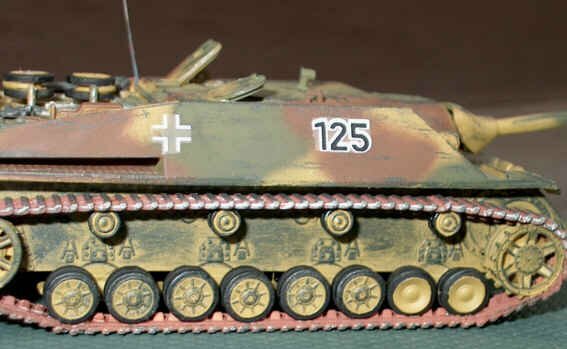 Using all Revell's wheels would also prevent me from using the original tracks, so I took the PZ IV J ones, which are much more accurate. You need to be careful when fixing new wheels on the ESCI gear, they need to be in the right track and, as you notice on the scans, the Revell sprocket is a bit smaller and its teeth are more delicately molded then ESCI's, causing the tracks to hang down a bit on the front. The major complaint about the L/70 kit was the incorrect exhaust system; I left off the large tank as suggested in the article and added the two vertical exhausts of Revell's kit. I repositioned the machinegun port slightly upwards, but unfortunately I broke it with my scalpel so I had to build a new one. Be careful when working in that area, because it is the most eye-catching. In addition to that, the pioneer tools and spare bogies and tracks have been added to the backside of the vehicle. I hope their mounting is nearly accurate for a late version JgdPz IV. The only thing I found half way acceptable is the top hull which catches the proportions very well. 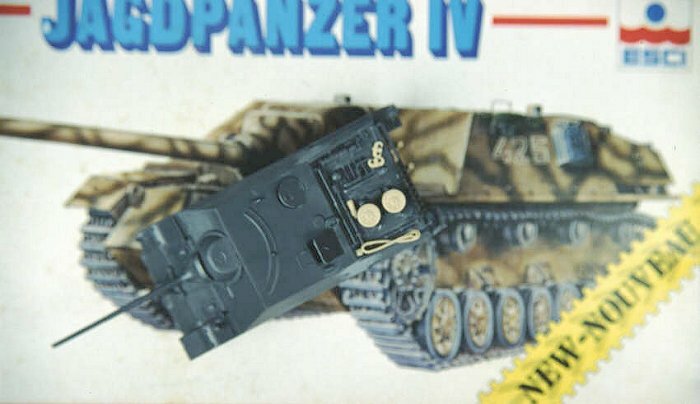 Adding to Doug's criticisms: it totally misses the details of the "Zapfenbauweise" that even the matchbox kit features (armour plates interlinking on edges by tenons). I painted the hull with 1943 Dunkelgelb by Testors, which is a good and accurate color in my opinion. 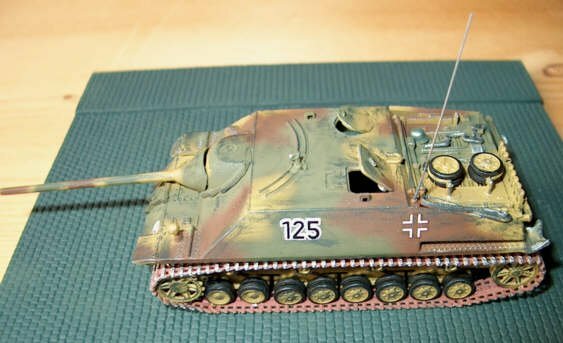 I used Revell Lederbraun (84) and Bronzegruen (65) to apply a commonly used three-tone camo, which comes close to the late ambush scheme. Generally I find it more practical to finish the gear, but leaving the top hull severed and spray those two seperately. Aging was done with gunmetal grey by molak, after all I think drybrushing with darkmetal makes more sense because bare metal reacts very quickly with air normally within 24 hours. I say this because I used to drybrush with silver which I assume to be wrong. I discussed this matter also with other braille scale modellers at the missing-lynx forum. There was a large variety of comments but at least I suppose we concluded that spots that are excluded by daily use and scratches (unlike ladders, hatches, handles etc) need to be dark metalgrey. 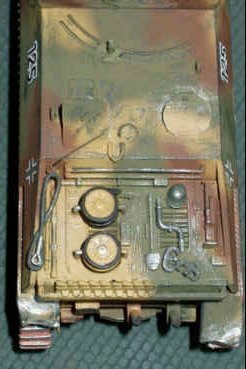 The three digit code is from a Revell 1:72 modell, while the tactic mark for the 116th Panzerdivision comes from the identical JgdPz IV kit by Matchbox. The 116th Pz Division had large numbers of these vehicle. To be honest I don't bother with the scale of decals; I see no reason to reject just because they're not "printed in register". Keep in mind that in these days all the marking were applied most hastely without much care. 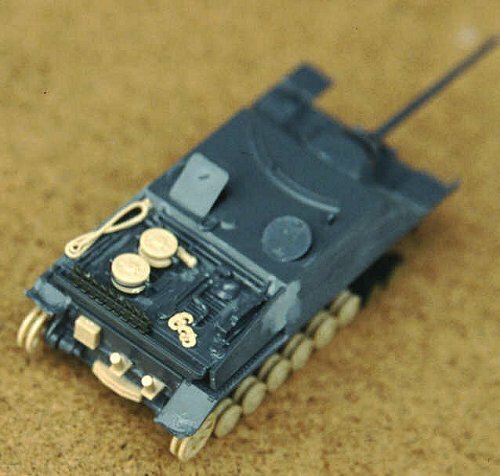 I know this might hurt but the Matchbox 1:76 kit seems to be much more accurate than ESCI' overpriced and rare JgdPz IV. I ordered mine at Kitlink and was even bothered with paying 30 dollars just for the customs. European customers: always deny a shipping with a bill, kindly ask the seller to ship without one, presenting the bill via email or fax. This means if you don't have an ESCI JgdPz IV at hand, don't waste your time and money on ebay; it's not worth it. Better to wait for Hasegawa to release these kits. This kit is simply to erroneus and should be left to all the die hard collectors waiting for one. I have to admit that I'm not fully satisfied with the outcome and I'm going to try another one, probably with skirts, the L/48 gun and Zimmerit. I hope that at least you like the kit. References: Die deutschen Panzer 1926-1945, F.M. Senger und Etterlin, Bernard&Graefe Verlag Bonn 2000; Panzer IV -The Panzerkampfwagen IV Medium Tank 1939-1945, Kevin Hjermstad, Squadron/Signal publications; "On the Way!" Panzerjäger vs. Jagdpanzer by Doug Chaltry.